So remember my Instagram where I mentioned I was in an elevator with Olivia Palermo last week and she told me she loved my shoes? In case you didn’t know already, the shoes were these Aquazzuras – did you know OP helped curate a small collaboration collection with the designer as well? The style icon and shoe designer are very close friends, so a collaboration between the two was not too shocking. A few favorites from the collection include these olive suede ankle boots, these black strappy sandals, and these silver ankle-strap sandals. Simple and sophisticated, don’t you think? Shop the entire collection exclusively on NET-A-PORTER. Since I’m on such a burgundy/deep red kick for fall (exhibit A), I’ve scouted out some more pieces in this hue that I’m craving this week. This tote is faux leather and under $55, but the bag doesn’t skimp on quality or looks – needless to say, I’m super impressed! Remember Stuart Weitzman‘s ever-so-popular Highland, the heeled over-the-knee boot from last winter? Well this season they’ve created a flat version, and I may like it even more than the original – and I guess I need to mention that it comes in five shades, including burgundy. Finally, while this Kate Spade dress isn’t a wine color, it is the perfect shade of red. I find it’s just what I’m looking for in terms of a fall/winter cocktail dress. Holiday parties, winter weddings and more would be simplified with this number, don’t you think? The bow detail on the back is just perfect. #15 is so good, great picks! Great little edit here! that Tory Burch bag is perfect and I can’t wait to see her show today! I’m so sad that the Gap dress is sold out. It looked like a lovely summer-to-fall transitional piece. And, yes, you should probably pick up that little Kate Spade number. The color is divine! You are very quickly becoming one of my favorite fashion bloggers! Love you style. Love the metallics and blacks here and THAT skirt, amazing! OMG #8, #15 and #17!! I missed your Olivia Palermo run-in! Very cool. That metallic, gold skirt…..I now need it in my life!! Wow, great picks! How amazing are those Alexander Wang booties?! Who knew a travel mug could look so chic? Love the giraffe print! And that leopard/striped infinity scarf is so up my alley! I love this mix of prints for Fall! I have been eyeing those Alexander Wangs. Such a cool mule choice!! I want them… now. Okay, so this edit is everything. 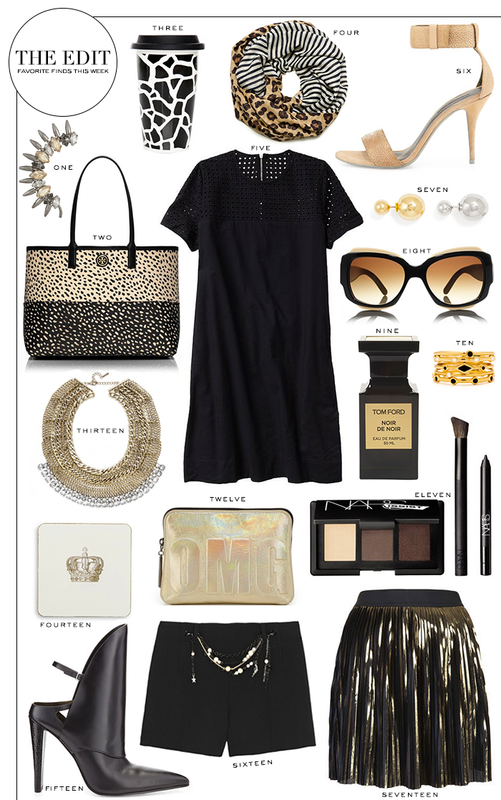 I want it all, especially the scarf, shades, LBD, NARS palette, metallic skirt, and OMG bag from Phillip LIm. Love everything in this edit!! Those boots!! Ahh! If I were in an elevator with OP, I would probably have a panic attack. For real. She is flawless. Love these picks too! That black dress is so adorable! And I love the TB scarf! Well, it goes without saying (but I will anyway) that your elevator escapade with Olivia Palermo sounds epic. I like to think I would have played it cool, but that probably wouldn’t have been the case. BTW, she’s totally right. Those shoes are awesome. Among other things that are awesome, #1 and #4. I believe I “need” them both. I’m feeling very jealous that you were able to breath the same air as OP!! And if she said she loved your shoes, then you KNOW they are stylish!! And i totally agree – they are. That gold foil skirt is gorgeous and so affordable! Infinitely jealous of your Olivia Palermo encounter… but I mean those shoes are ah-mazing.